The National Health Service is under huge pressure, made much worse by the Prime Minister’s broken NHS promises. David Cameron promised he would protect the NHS. He put up posters before the last election pledging “I’ll cut the deficit, not the NHS”. But in the two years after the election, the real NHS budget was cut. So Rotherham hospital is being forced by the government to cut £50 million from its budget over three years, at the same time as demand for health services rises. Staff are stretched, waiting times are going up and nationally we have already seen the biggest ever decline in satisfaction with the NHS from its highest-ever level under the last Labour government. David Cameron promised to “end the top-down NHS reorganisations that have got in the way of patient care”. Yet he has forced through the biggest reorganisation in NHS history, set to cost up to £3 billion which could and should have been spent on patients. The legislation was opposed from the outset by Labour (see, for example, here and here) and also by NHS staff, trade unions, leading health experts and commentators. The Tory-Lib Dem NHS reorganisation sets up the NHS as a market, exposed to the full force of competition law for the first time. Ministers have also relaxed restrictions on NHS hospitals treating private patients so they can now get up to half their income from people paying to jump the queue for health care, and the new NHS market regulator – Monitor – is putting pressure on hospitals to do more private work. The hospital employs 78 fewer full time equivalent nurses than it did two years ago. 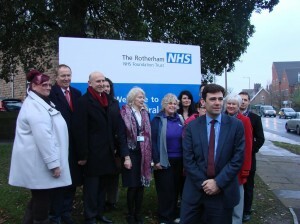 The average waiting time in Accident and Emergency in Rotherham in 2010 was 2 hours and 33 minutes. By this year that figure had risen to 3 hours and 7 minutes. Three years ago, 1,286 people waited longer than four hours in A&E. Last year that figure rose to 3,338. Late last year the hospital announced it may need to make as many as 750 job losses. Rotherham Hospital Trust has overspent its budget during the last two years and senior managers have made serious mistakes over a new IT system and financial controls. In February, the NSH regulator Monitor stepped in and announced that Rotherham was in “significant breach” of its licence to operate because of the financial concerns. 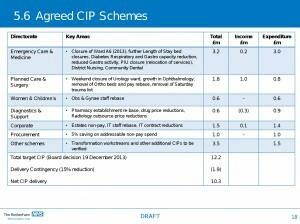 The hospital has been forced to work with an interim Chief Executive and Chair of the Trust and use expensive outside consultants to prepare a financial plan for the future to cut £50 million from the budget over three years. They are also considering which services will be financially viable. This plan must be submitted to Monitor. It was expected in September, but the deadline has now been put back until December. Thanks to the dedication of staff, Rotherham Hospital continues to provide very good quality healthcare free at the point of need. It’s an essential part of our community which we all rely on and very strongly support. As staff, patients, and local representatives, we will fight to make sure it stays that way.